Levi’s Jeans has a long history in the denim industry. The brand is one of the pioniers as it comes to unique denim developments. Since 1873 Levi’s Strauss & Co has been a leader in the industry. In the year before, 1872, Levi Strauss received a letter from one of his fabric customers, Jacob Davis, a tailor from Nevada who invented the rivet, with a question if they could partner-up together for the patent for the rivet. They joined forces and the rest is history. Next to the rivet Levi’s Jeans has some more very important key features on their jeans. Today I want to zoom in at the 7 key details from the back pockets of their jeans. The stitching on the back pockets from a pair of Levi’s Jeans is called Arcuate design. The name refers to the form of an arc. The arcuate stitching dates back to the earliest Levi’s waistoveralls from 1873. The arcuate stitching probaly refers to a flying rocky mountain eagle. This can’t be confirmed by the company as the Levi’s headquarters and two factories were destroyed after a heavy earthquake and fire in San Francisco in the year 1906. The earthquake destroyed their complete archive. 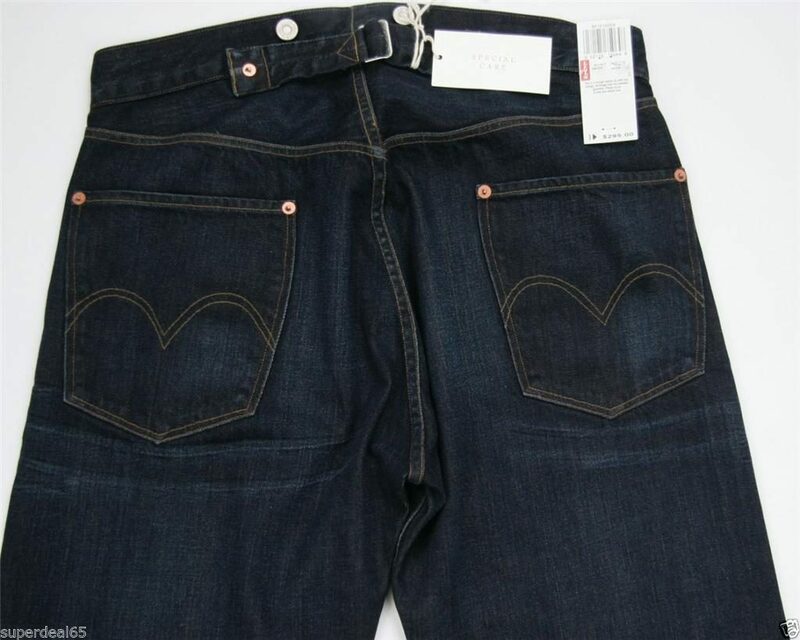 The first Levi’s Jeans arcuates on the back pockets were stitched with a single needed sewing machine. Picture from a pair of Levi’s 1878 pants from the Levi’s Vintage Clothing (LVC) collection. Pic by Unionmade store. You will see various different single needed arcuate curves on vintage pairs of Levi’s back pockets, this reflects each operator skills. These curvy arcuates are also known as Crazy Eagle. This can be seen on this original worn pair of Levi’s 501XX from the 1930’s. See more details of this pair here. In 1943 Levi’s Jeans registered their arcuate as a trademark to prevent copying by other denim brands. After World War 2 Levi’s Jeans started to stitch their arcuates with double needed sewing machines. 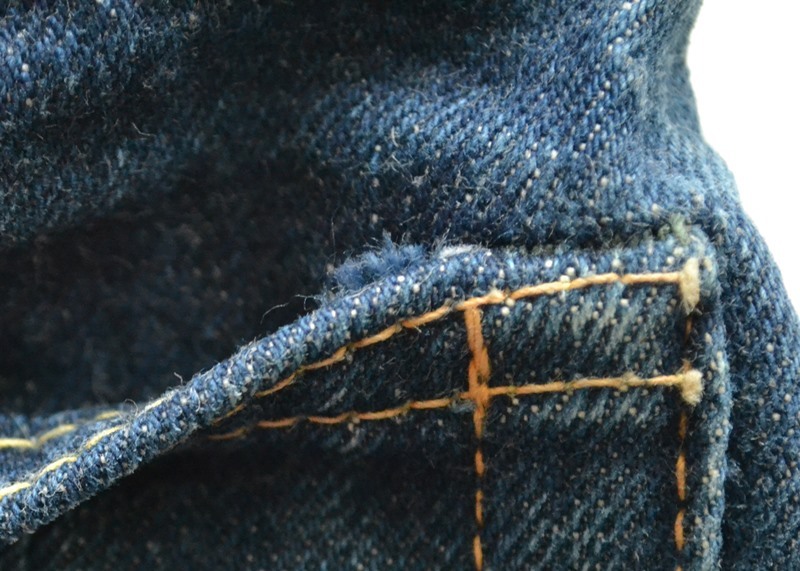 The picture here below shows the double stitched arcuate on a vintage pair of Levi’s 501XX jeans from the late 1960’s. See more details of this pair here. Double stitched arcuates on the back pocket of a vintage pair of Levi’s Jeans. Another funny fact of the double stitched arcuates is the appearance of the diamond in the center of the arcuates. This diamond appears when the double needled thread overlaps eachother. Diamond appearance from double needed stitched arcuates on vintage pair of Levi’s 302 Jeans from the early ’60’s. See more details of this pair here. The orange (tobacco) thread used on the original Levi’s Jeans has now become an industry standard. Legend has it that tailor Jacob Davis originally insisted that the thread has to be orange to match the jean’s copper rivets. 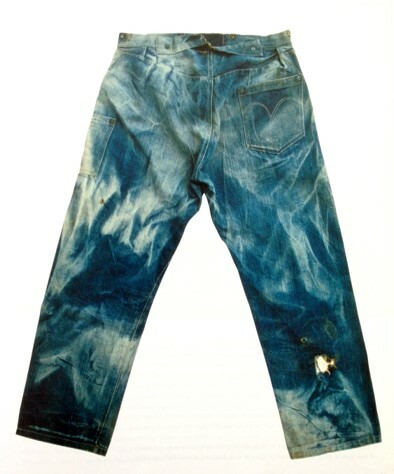 But Levi’s Jeans can’t confirm this rumor as all the records are destroyed by the earthquake in 1906. On vintage pairs of Levi’s Jeans, mostly on early ‘Big E’ jeans, you see a combination of yellow and orange thread. Combination of orange and yellow thread of back pocket of vintage pair of Levi’s Jeans from the early ’60’s. The Batwing is designed in 1967 by Walter Landor & Associates. The colour red was used as a link to the Levi’s Red Tab. The outlines of the Batwing logo comes straight from the Levi’s 501 Jeans back pockets. If you look closely at the back pockets you should see the Batwing just above the arcs of the arcuate design. The Levi’s Jeans Batwing logo. 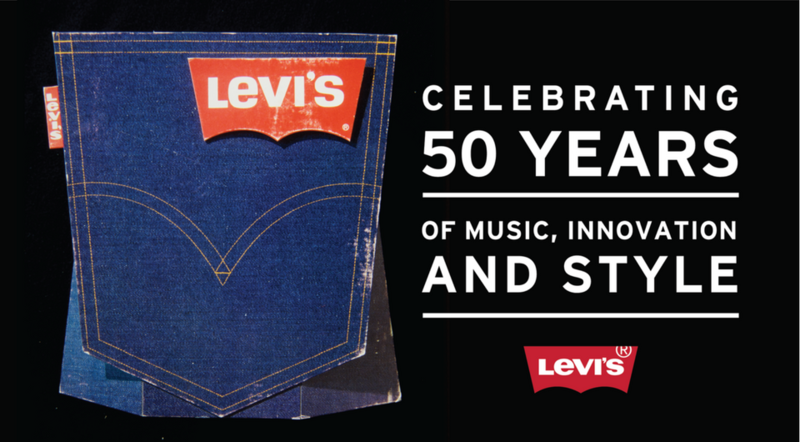 In 2017 it was 50 years ago that the Batwing logo by Levi’s Jeans was introduced. The Batwing logo is really popular by youth at the moment. In the first half of 2017, Levi’s sold more than 3 million of their Batwing t-shirts. It was the year 1936 that Levi’s Jeans introduced their famous Red Tab onto the right back pocket of their jeans. The Red Tab was created to differentiate Levi’s Jeans from their competitors. This was because a lot of their competitors were also using dark denim and also arcuates on the back pockets. The colour red for the Red Tab was chosen because it contrasted well with the dark denim and was easy to see. The idea to place a red folded cloth ribbon in the structural seam of a rear patch pocket came from the National sales manager Chris Lucier from Levi’s Jeans. 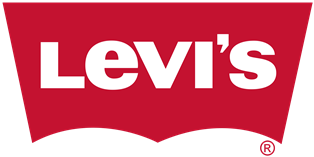 The word LEVI’S is stitched in white in all capital letters on one side only of the tab in the beginning. During the early ’50’s they changed the Red Tab into a double-sided Red Tab which means that on both sides of the tab LEVI’S was written. Vintage ‘Big E’ tab on a vintage pair of Levi’s 501XX from the ’60’s. See more detail shots of this pair here. Levi’s Jeans switched in 1971 the letters on the tab to Levi’s, with a lowercase ‘e’ instead of the ‘E’ in the word Levi’s. The Red Tab with kapital ‘E’ are nowadays known as ‘Big E’ items and were produced until that year. The ‘Big E’ items are now true collectors items amongst denim collectors. Levi’s Jeans Red Tab with lowercase ‘e’ on a pair of Levi’s 501 Jeans from the early ’70’s. See more details from this pair here. Some Red Tab on Levi’s Jeans are blank and only has a registered R on it. 1 out of 10 Red Tabs on the backpockets of a pair of Levi’s jeans is a blank Red Tab and does not include the full name of Levi’s. This to protect the Red Tab itself. Blank Red Tab of a pair of vintage Levi’s Jeans from the early ’70’s. See more shots of this pair here. 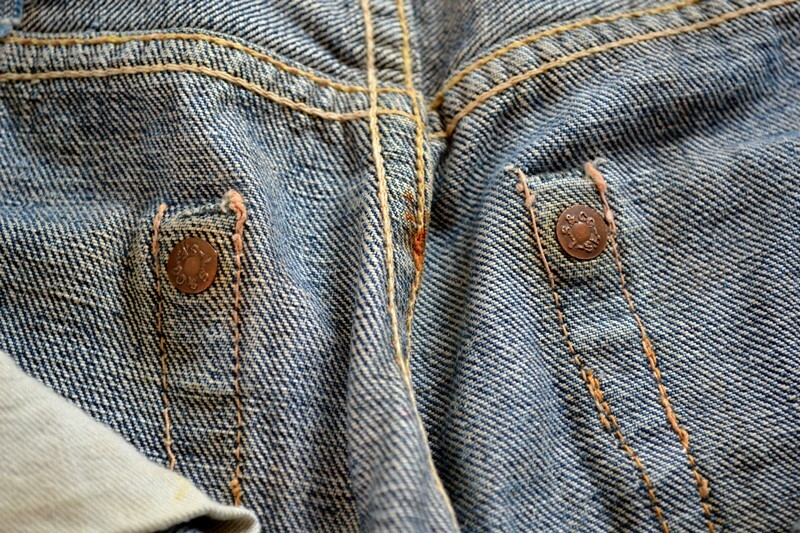 Another key feature on vintage pairs of Levi’s Jeans are the so called hidden rivets. In 1937 Levi’s Jeans introduced these hidden rivets on the back of the pockets. The rivets were sewn so that they were only visible from the inside, due to consumer complaints regarding scratching furniture and saddles by the previous rivets that were placed on the outside. 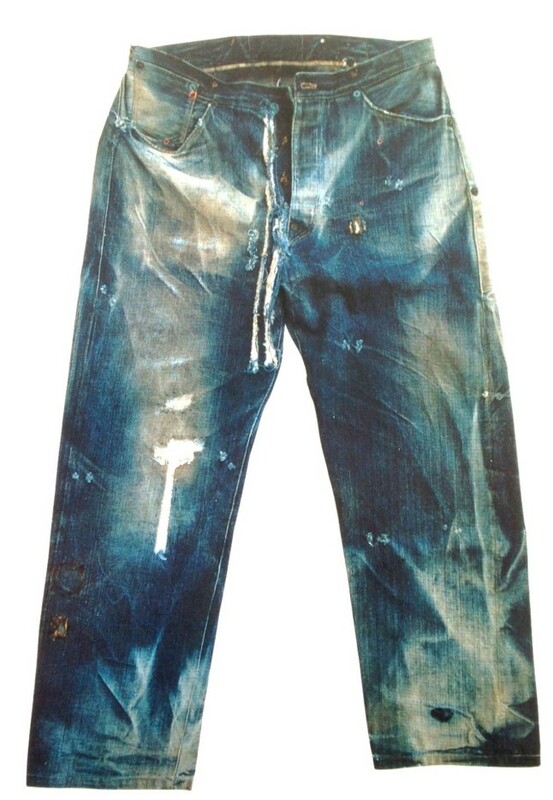 As Levi’s 501XX Jeans were popular by cowboys they complaint about their scratched leather horse saddeles. Vintage pair of Levi’s 501XX Jeans from between 1901 and 1910 with rivets on the outside of the backpockets. Pic from the Levi’s Jeans HQ from San Francisco. Hidden rivets on the inside of a pair of Levi’s 501XX Jeans from the 1930’s. On each pair of Levi’s Jeans 501XX produced from 1937 was a pocketflasher with the words: ‘The Rivet’s Still There’ as introduction of the hidden rivets. 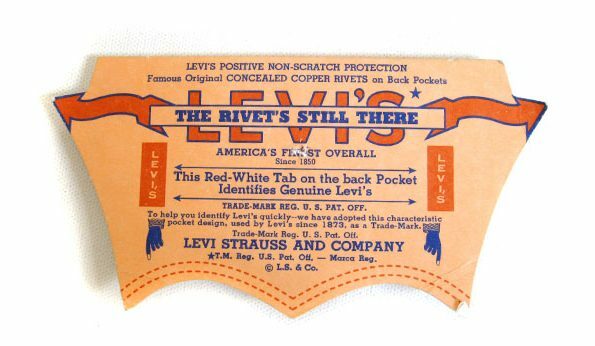 The Levi’s pocket flasher with the words: ‘The Rivet’s Still There’. Levi’s Jeans changed in 1966 their hidden rivets into bar tacks on their jeans. Technology made it possible to strength the back pockets with bar tacks instead of rivets. This was the end of complaints about scratching furnitures. Note that also the hidden rivets came through the denim fabric after intense wear, so bar tacks were the perfect solution. Black bar tacks on the corners of a vintage pair of Levi’s Jeans. 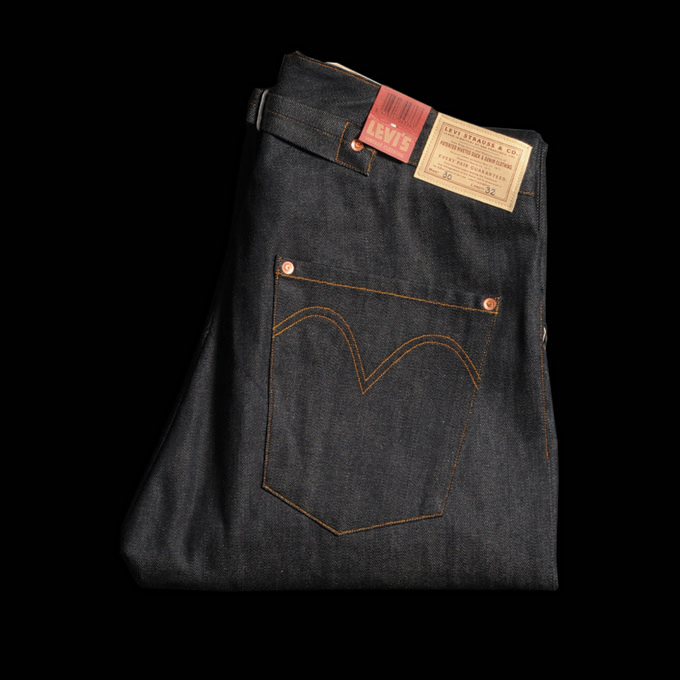 The horisontal double felled seams on the top of the back pockets of vintage pairs of Levi’s Jeans are single stitched. Later 501 models from around 1987 and later are chain stitched. Single stitched back pockets on a pair of vintage Levi’s Jeans. Chain stitched back pockets on a pair of late ’80’s Levi’s Jeans. 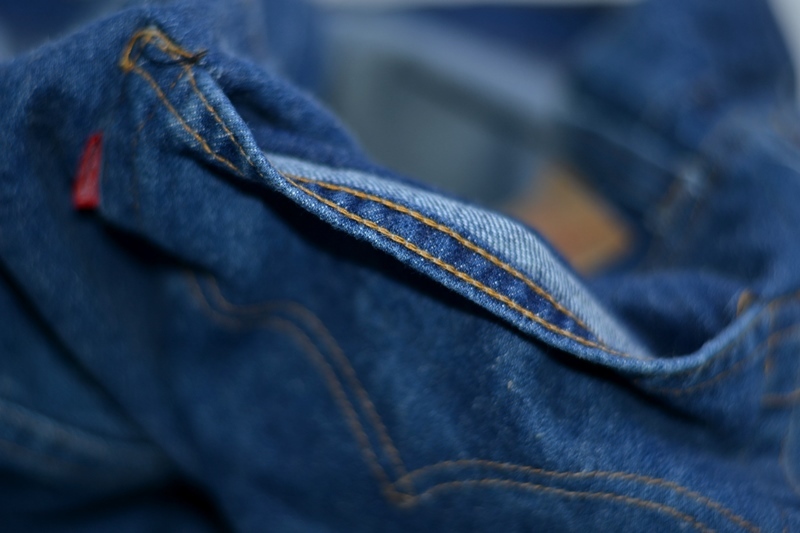 The first pairs of waistoveralls from Levi’s Jeans didn’t had five pockets. 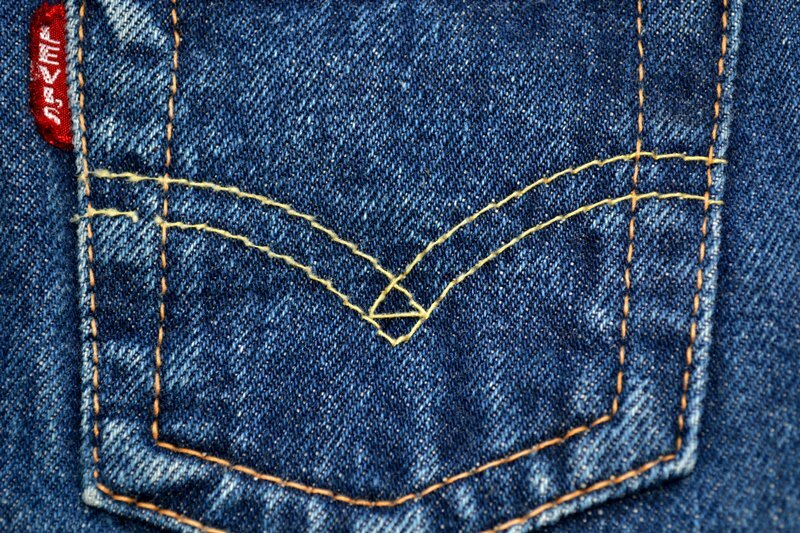 Most of the people think that the fifth pocket on Levi’s Jeans was the watch, or also known as coin pocket, but in fact this isn’t correct. 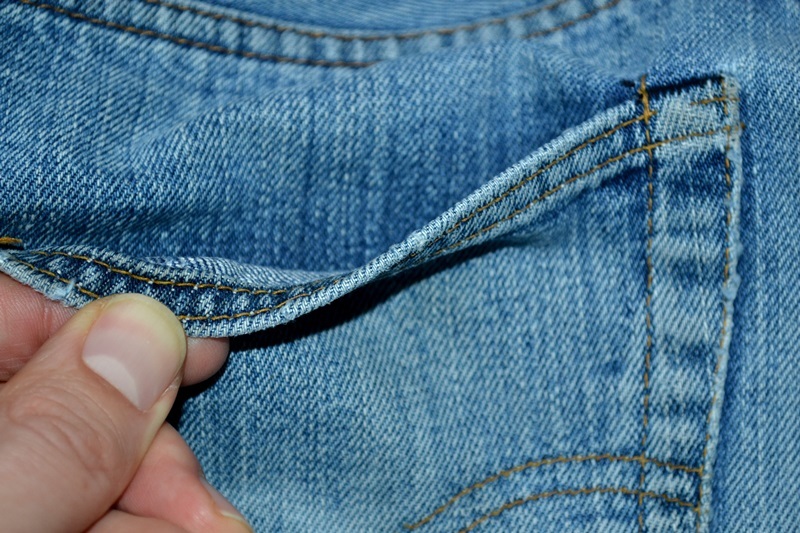 The fifth pocket was the left back pocket. 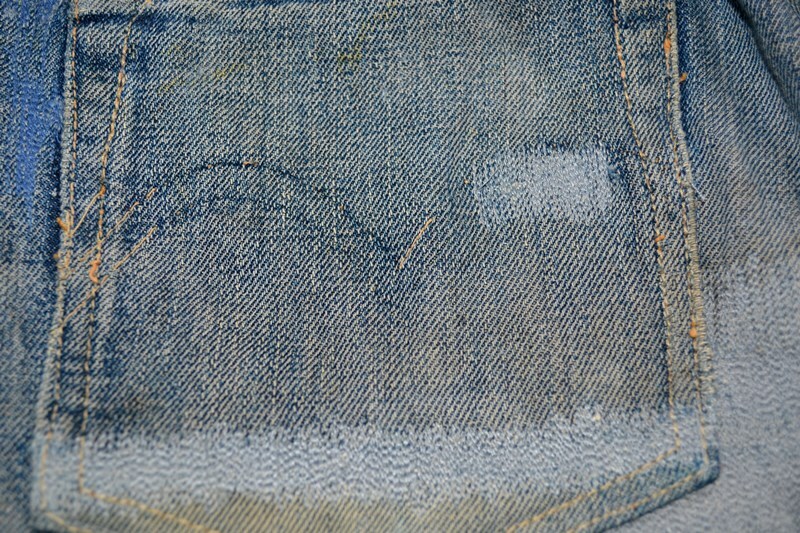 Levi’s added this left back pocket around 1901 on their waistoveralls. 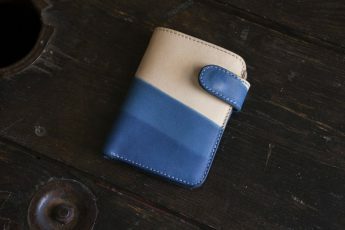 The reason why this pocket was added later is because the tool pocket disappeared and were replaced by the fifth back pocket. By adding the fifth pocket the term five pocket was born. Vintage pair of Levi’s waistoveralls from 1880. 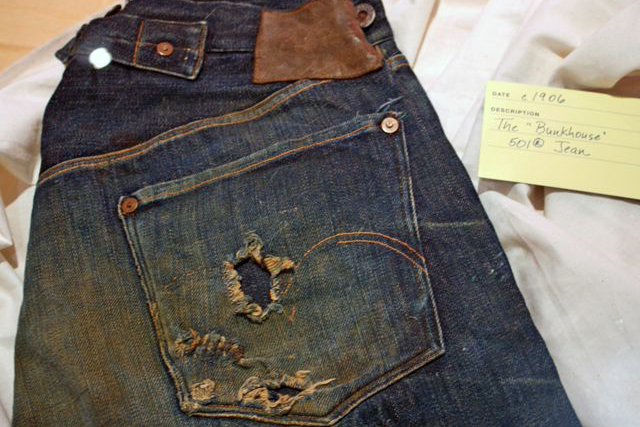 This pair was bought by Levi’s Jeans in 2001 through an eBay auction for $46,532. This pair is know as one, maybe the oldest, pairs that is still alive. Now part of the Levi’s Jeans HQ archive in San Francisco. Levi’s 501 Jeans from 1901 from the Levi’s Vintage Clothing (LVC) collection. Pic from eBay. Hey Wouter, my question is about Levi’s trucker jackets. I have a new trucker jacket, it has silver buttons, I am used to having copper buttons. Why does mine have that? Mine is a bigger size but, should that matter? P.S. I really enjoy your stuff on instagram! Thanks a lot! Just send you an email. Do you know what factory 16 refers to? I have just got some May 1975 BNWT little e 501 (66 cut) which have got 16 on the top button (like some of your’s). Curiously, the also have selvedge on the inside of the coin pocket. Just send you an email, check it. I have that experienced by myself as I have a few of those sizes in my archive too. Don’t know why they do that actually. Lifetime Levi’s (only) fan with a question. In the last several years I have noticed the red tap on the back pocket furling/curling so the Levi’s tap remains/ flat as it is when you purchase the Levi’s clothing (jeans and jackets) This happens when you air dry clothing too.. I attempted to tape the tag flat when I dried and stored however when I took the tape off to wear the tab returned to curling. Any suggestions out there? Your jeans are probably produced during the end of the seventies. Check if there’s a small or big E Red Tab on the right back pocket. hello, I bought a pair of new 501 jeans on the Levi’s online site and on the red tab there is only the R and not the word Levi’s. Why is this so? Is it a wanted mistake or a case? Or what else? 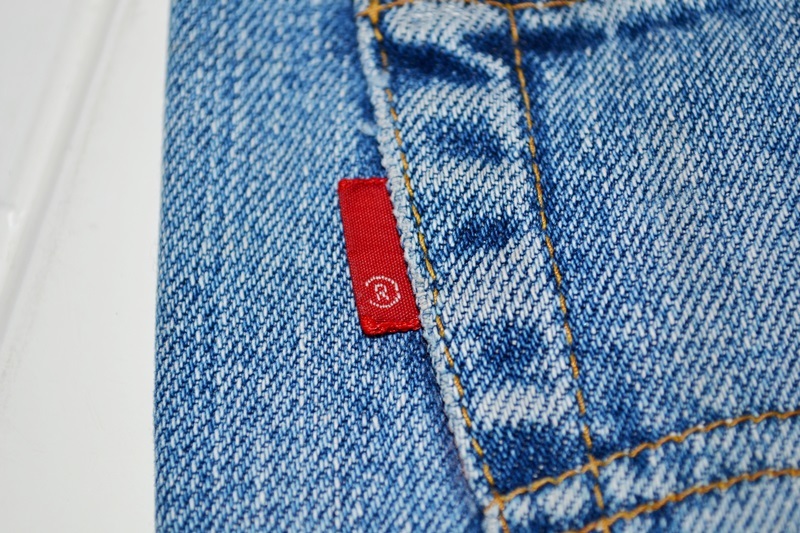 Levi’s put on every 1 out of 10 Red Tabs only a R to protect (register) the tab itself. So, it’s not a mistake. Enjoy your jeans! Approx what year would they date ? My levis 501 have # J stamped on back waist button, numbers printed on pocket bag, plus yellow thread V stitch. What year would they date from? I’ve occasionally seen very dark blue Levi’s with what looks to be white threading on the back. In fact, in “Man of Steel,” Henry Cavill (as Clark Kent) appears to be wearing just such a pair at the end of the film. (I could send a screen grab.) I’ve searched in stores and online but have yet to find what I’m looking for.